Nintendo proved that its cardboard Labo kits could actually be decent gaming accessories — especially for kids. But the idea of using Labo to bring VR to the Switch sounds even more far-fetched. Could an under-powered system with a low-resolution screen actually produce believable virtual reality? It turns out, it can. Obviously, the Labo VR kit isn’t a legitimate competitor to the Oculus Rift, HTC Vive or even PlayStation VR. It’s even less impressive than the standalone Oculus Go. It has more in common with Google’s Cardboard initiative, which at best was a way for people to experience 360-degree videos with their phones. Nintendo isn’t one to follow the crowd, though. Its spin on VR is more centered around accessibility and brief moments of surprise and delight. After trying out a few Labo VR Toy-Cons at a media event, I came away impressed with what Nintendo managed to accomplish with the Switch’s limited hardware. 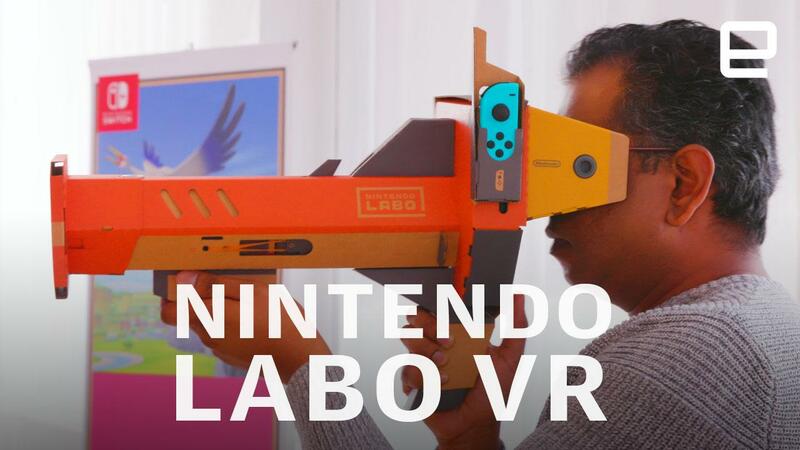 The Labo VR goggles serve as the centerpiece for all of Nintendo’s virtual experiences. The Switch slides into the front, and you can then plug in the goggles to other Toy-Cons, like the Blaster. The goggles themselves are relatively simple, with basic lenses and plastic lining around the eyepiece. It’s relatively sturdy — a good thing, since you’ll be handling it quite a bit. For my first experience, Nintendo representatives sent me into the ocean with the Toy-Con camera. When I slipped it on, I was deep underwater, with all sorts of marine life swimming around me in every direction. They weren’t crystal clear — the Switch only has a 720p display, after all — but from their colors, shape and size, I could make out manta rays and clown fish. Surprisingly, I didn’t feel nauseous. Sure, everything was a bit blurry, but the animations and motion tracking was smooth enough to give me a decent sense of presence. With the Toy-Con Blaster, I fought off an alien invasion as I walked down a city street. It works like a shotgun: First you have to pull the barrel back, then you can hit a button to take out an alien. Again, I didn’t expect much, but the Switch still managed to let me accurately take down an army of aliens like I was a Nintendo-fied Master Chief. On the more whimsical side of things, there’s the Toy-Con Bird, which you literally stick your head in. And as if that’s not silly enough, you put your hands through wings on the side and flap them around. Inside the VR Goggles, I was flying on the back of a bird on a gorgeous tropical island. Outside, I’m sure I looked like a complete goof. I didn’t mind, though, because I was soaring through the sky. The Toy-Con Wind Pedal is pretty self explanatory. It looks like a simple pedal made out of cardboard, but there’s also a large piece of cardboard on the very end that blows air in your face when you press it down. That seemed odd until I jumped into the “Hop Dodge” experience, where I played a frog that’s trying to avoid obstacles as it makes its way into space. With every jump, I felt like I was in the shoes of the virtual amphibian. Finally, the Toy-Con Elephant let me draw in 3D space, like a stripped down version of Google’s Tilt Brush. At first, I didn’t understand why Nintendo went with such an elaborate Toy-Con design. But as I painted, I realized the elephant’s trunk made for an ideal brush. It’s flexible, but also keeps your hand near the Toy-Con Goggles, so they can accurately track your paint strokes. These are just a handful of the experience the Labo VR kit offers, but they’re enough to make me think that Nintendo actually understands what it’s doing. It’s not targeting the highest resolution graphics, it just wants to make something that kids can pick up and play easily. (You can even play them in 2D if the VR portion makes you sick.) And who knows, maybe it’ll lead them to deeper VR experiences down the line. Like Nintendo’s previous Labo kits, there are also Garage modes that’ll let kids create their own experiences in either 2D or VR. To give you a sense of what you can build, Nintendo includes 64 mini-games in the box, which you’re free to edit to your liking. I tried out a handheld foosball-like soccer game, which I played while holding a Switch with a Nintendo rep; a simple 2D fighting game; and a VR platformer, which reminded me of Nintendo’s failed Virtual Boy console. You can snag the entire Nintendo Labo VR Kit for $80, or get the starter pack for $40, which includes the Goggles and Blaster. You can pick up two expansion packs for $20 each, which include all of the other Toy-Cons. While it might seem a bit confusing, I appreciate this pricing flexibility. For parents, there’s no telling if their kids will actually like playing around in VR, so it might make more sense to start with the cheaper $40 kit. Oddly enough, Nintendo seems to be taking a page from Sony with VR. It’s approaching a whole new medium in a way that makes sense for its audience. In the end, it doesn’t matter if the Labo VR isn’t as powerful as the Oculus Rift or Vive. It’s for kids, and that’s perfectly fine.